A dental lab technicians job is a mashup of technology, artistry, and dentistry. You’re spreading smiles, one dental prosthesis at a time. A laboratory will be your home away from home, because dental lab technicians generally work the standard 40-hour week. You need be able to work well with your hands, be an independent worker, and have impeccable attention to every detail. To learn more about becoming a dental lab technician and everything that goes along with the career, please read on. 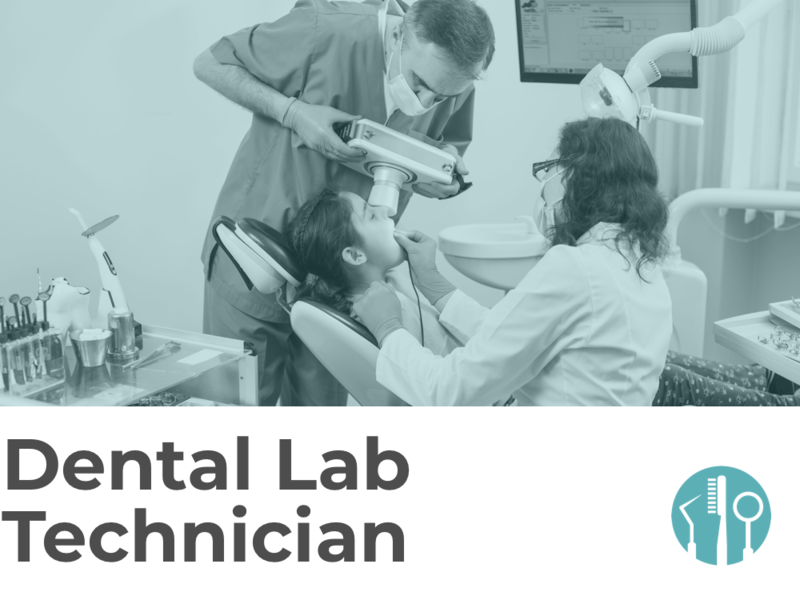 There are two different types of dentistry you’ll need to be well-versed in as a dental lab technician: restorative dentistry and orthodontics. Restorative dentistry is for those patients who have lost teeth for a variety of reasons, such as from an accident or illness. You’ll create teeth to replace the lost ones so the patient can have normal oral functions. Patients who aren’t comfortable with their smile often need their teeth moved or stabilized in order to optimize function and prevent painful oral dysfunction. This is where orthodontics comes into play. To create the tooth restorations unique to each individual is considered an art. You have to be able to make each tooth perfectly imperfect, so it’s fitting to the mouth of the patient, creating a natural and complete smile. Technology in the world of dentistry is always evolving and changing, and dental lab technicians are required to keep up. Various types of high-tech materials are used including metal alloys, ceramics, and plastics. You must have the skills to work with these types of materials in order to meet each patient’s individual needs. What you’ll actually be doing will depend on the lab you’re employed with, and/or what you’ve specialized in. Get trained on-the-job through a laboratory. Training can take up to four years. After you’ve completed your training, you can consider becoming certified through the National Board of Certification in Dental Laboratory Technology. These certifications are optional, but some dental labs will prefer hiring certified dental lab technicians. States do not require licensing for dental lab technicians. Bls.gov says the median annual salary for dental lab technicians is $35K, with the top 10 percent of those in this profession earning $60K. The highest paying states for dental lab technicians are District of Columbia ($76K), Montana ($52K), Alaska ($51K), Rhode Island ($48K), and Massachusetts ($48K). There will be 5.5K new positions opening through 2026. As long as you’re familiar with all the technology and have your certification, you shouldn’t have trouble finding a job! California ($43K), Florida ($39K), Texas ($43K), New York ($45K), and Michigan ($37K) all have the greatest level of employment for dental lab technicians. Your actual salary will be determined by factors such as your specialty, experience, where you work, and what state you’re in. The right training from the right dental technician school will put you on the path to a successful dental lab technician career. Land your dream career and start building your educational foundation as a dental lab technician. To learn more about the industry and becoming a dental technician, make sure to review our common career questions. To learn more about the industry and becoming a dental technician, make sure to review our common career questions.